Across the country, officers like myself are working hard with partners to help protect the environment from the detrimental effects of waste crime. One way we’re doing this is to target businesses and individuals who illegally dismantle vehicles and deal in scrap metal. Commercial vehicle dismantling and scrap metal businesses need permits to operate – both from the Environment Agency and local authorities. When a vehicle has reached the end of its life, it must be scrapped at an authorised treatment facility (ATF). 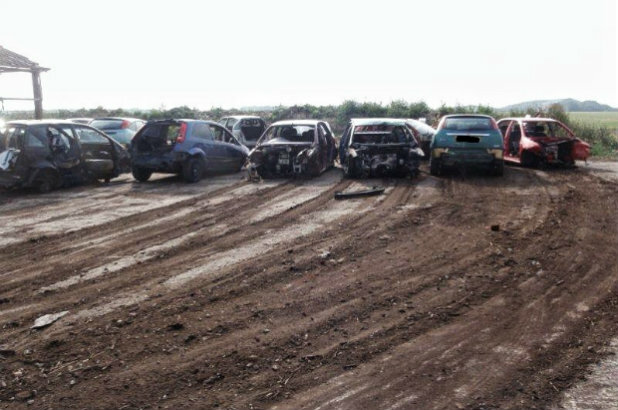 Legitimate operators run sites where vehicles are 'depolluted' and stripped for parts. This means they remove all the hazardous components or fluids – such as engine oil, engine coolant and batteries – which could be dangerous to the environment if not disposed of properly. To do this safely, the operator must hold a certificate of technical competence and have environmental management systems in place, as well as being legally required to take extra care when producing and disposing of waste. There are also minimum infrastructure requirements in place to protect the environment. We want to support legitimate businesses, who can lose income to illegal operations, and ensure no harm to people and the environment is caused by these illegal sites. One hotspot for this illegal activity is the Boston area, south Lincolnshiren, which is in my patch. We've been carrying out visits to suspected illegal operators and are working with local councils and other partners to help level the playing field for legitimate businesses which operate in the waste vehicle dismantling sector. Through intelligence gathering, we’ve identified several small and medium-scale sites of illegal vehicle dismantlers, unlicensed scrap-metal dealers and carriers. During visits, we provide people running sites with advice and guidance so they are made aware of how to comply with the law. We've made sure they know the dangers of depolluting without the appropriate conditions and the neccessity of having a fire risk plan in place. We’re also asking landowners not to allow illegal activities on sites or land they lease to businesses or individuals. Waste oil from dismantled vehicles can contaminate land and may have to be excavated and removed for disposal at significant costs to the landowner. It can also pollute groundwater and find its way into drains and rivers. While we provide advice to those who want to comply, we will continue to get tough on illegal operators, stopping those who flout the regulations. If you’re selling your scrap to a collector or yard, please ask to see see their scrap metal dealers licence, issued by the relevant local authority, and do not under any circumstances ask for cash. You should be paid by cheque or bank transfer to have a valid trail. We maintain a public register for registered scrap metal dealers on behalf of all local authorities in England. Details on the permits needed to operate a waste business can be found on GOV.UK. are scrap dealers allowed to operate from residential properties, and park their large vehicles on that same street, surely not. Hello, Thanks for contacting us. Please call our contact centre on 03708 506506 (8am - 6pm Monday to Friday). They will take a few more details from you and advise what registrations / permissions are needed. Property across the street from us has cars coming and going regularly. They move cars on a dolly trailer behind a car that is itself untaxed or on an untaxed recovery van. They do cars up and sell but generally strip them out. Cars change every day. About 12 gone thru them in a fortnight. Move cars at night and day. Loud banging, Shouting and swearing, no health and safety awareness. Blocking road with vehicles. Loading/unloading whilst half on footpath. Council tenants but council don't seem interested. Please report this to our incident team on 0800 80 70 60. They will take further information from you so they can investigate further. I have been having the very same problem in Luton. DEFRA informed me in June that the business was unlicensed so I contacted Luton Borough Council. I have recorded a lie they told me on 2nd June and I suspect many more. It is still operating, apparently with impunity. DVLA have also been informed of their untaxed tow truck outside: again no action! These people seem untouchable. I wonder how long I'd get away selling alcohol from my home without a licence?!!! I live on the outskirts of Brixham, Devon. A the top of our very long hill is farmland and stables. All this weekend (12/05/18-13/05/18) low loaders have been going up the hill carrying 3 or 4 vehicles on each, then returning empty. It may be harmless, but it may not be. The road is called Southdown Hill, and our postcode is TQ5 0AE. Another one has just gone by going up; that's 15 wrecks i've counted so far. We have the same thing happening at Friningham farm Detling Maidstone cars Comming in and out on lorries.the site is covered in old engines leaking oil onto open ground. This is a farm full of animals quite concerning. In Luton you just can't win. When you complain to either Luton Borough Council or Bedfordshire police they turn you into a hot potatoe, passing you back and forth with neither side accepting responsibility. A group of individuals have just begun moving sizeable (although not significant in the grand scheme) amounts of scrap metal (bikes, cycles, mowers) onto a former allotment site directly behind my property. What is the appropriate course of action to flag this for investigation as this is very concerning? I am in Bradford and this morning got into a heated argument with a scrapman that pulled into our street and I saw him pulling on my neighbours iron fence and trying to reach over the fence to pull on other bits of metal. After trying to co front him and advising that was private property that he was trying to take and he got very nasty and aggressive telling me to keep my nose out! I know calling the police over this incident will not get a response but I worry that this man will be talking to others like that also. Probs others that are afraid to stand up for themselves unlike myself. Anyway I took pics of his licence plate as he was insulting me and driving off but this Behavior not be accepted or left unnoticed.